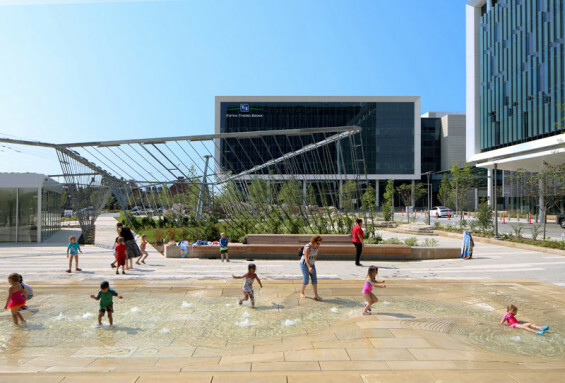 Recently, Eskenazi Health opened The Commonground, an outdoor public plaza design led by LAND COLLECTIVE Principal David Rubin. The plaza is just over an acre large and located adjacent to a historic Olmsted Brothers’ landscape which is part of Indiana University-Purdue University Indianapolis. 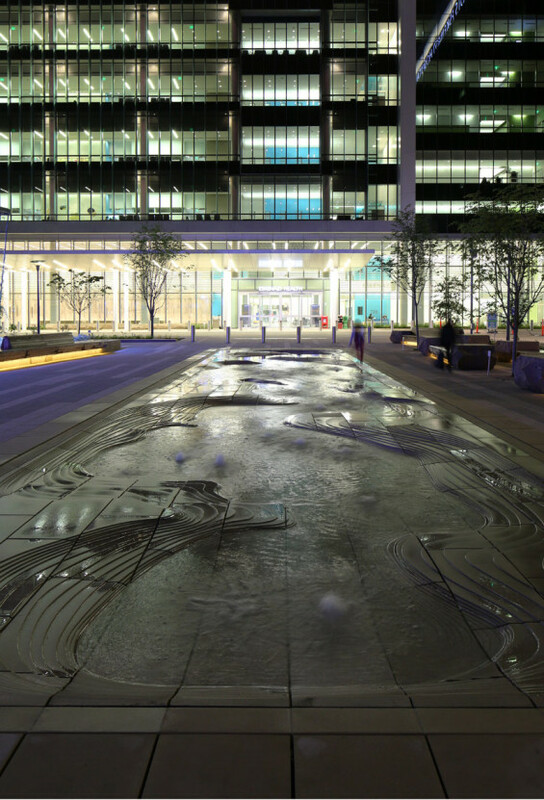 As part of the design guidelines which Rubin developed for the entirety of the Hospital Campus, a new Wellness Trail helps connect the new hospital to its community and the City’s cultural amenities and developing Cultural Trail. 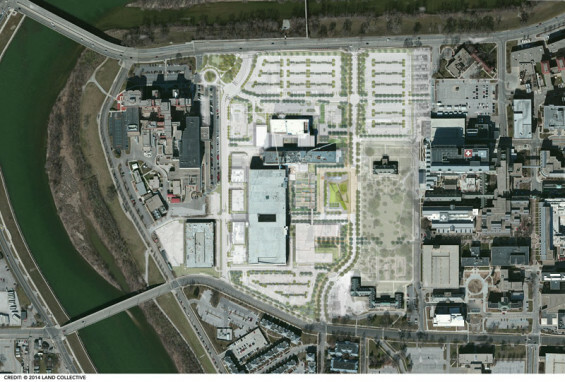 The new campus, including the plaza and facility expansion by HOK, is now on track to become the first LEED® Silver certified hospital campus in the country. 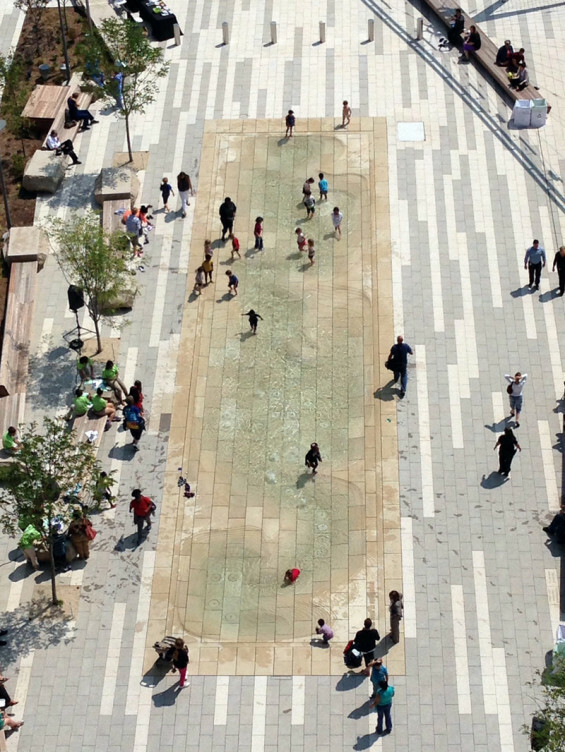 World Landscape Architecture recently had the opportunity to interview David Rubin about “The Commonground”…. 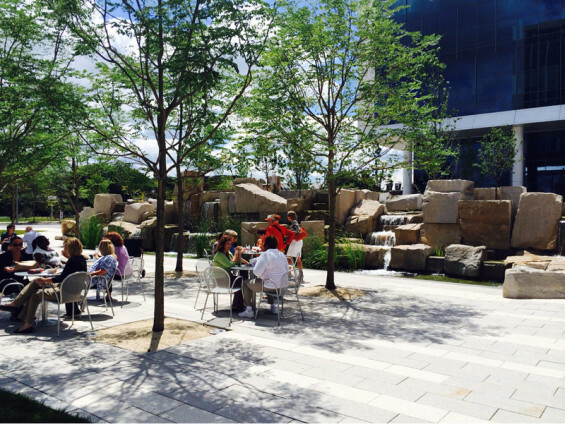 WLA | The Commonground is a new public plaza opened recently at Eskenazi Health campus in Indianapolis. Can you tell us more about the space and your involvement with the project? 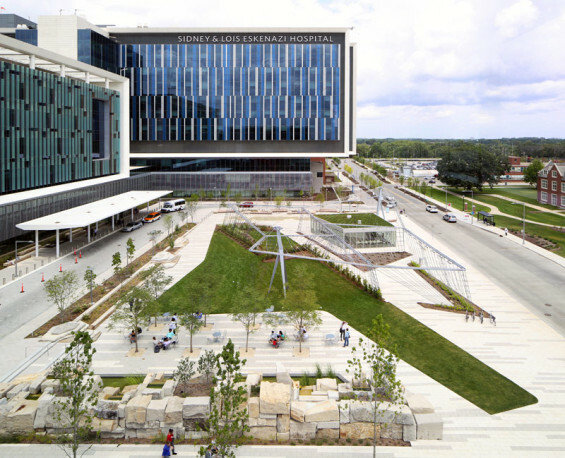 David | A little more than five years ago, Matt Gutwein, President and CEO of Health & Hospital Corporation of Marion County, cold-called me at my former studio to gauge my interest in the design of a new public space in Indianapolis at Eskenazi Health Hospital (then Wishard Hospital). What was extraordinary about this call was Matt’s enthusiasm for the services which the hospital offered the community of Indianapolis and Marion County: the highest possible health service for all of the area’s citizens, whether people of means or those who are economically challenged. He described a service that reached the full spectrum of our society – an extraordinary vision for civic health and well-being. What Matt may not have initially realized as he made his impassioned telephone pitch was that he was speaking to someone whose philosophy of design made him a kindred spirit. What Eskenazi Health does through health services, LAND COLLECTIVE’s practice does through design: our mission is to bring the full spectrum of our society into a dialogue through empathy-driven design. Whether you are someone who is privileged or underserved, you have a place in landscape. And as a result of our collaboration, whether you are seeking the services of Eskenazi Hospital or not, there is an opportunity for everyone to participate on The Commonground. My role on the project was establishing the overall project vision for the commons and the campus. As design lead, I informed all site-related elements, working with local landscape architects Ratio and Context; executive landscape architects Olin; trellis architects Diller, Scofidio + Renfro; fountain designers Fluidity Design Consultants; and design architects HOK (who designed the new Hospital buildings). I began the design of The Commonground while equity Partner at Olin, and continued to act as design lead after I won the 2011-2012 Rome Prize and founded my own studio, LAND COLLECTIVE. At the project’s inception, I also worked with Eskenazi Health to establish hospital campus guidelines for current and future growth, including the creation of a Wellness Trail which links downtown Indianapolis’ Cultural Trail with the White River Greenway through the northwest quadrant of the City in which Eskenazi Health Hospital resides. WLA | The Commonground is a flexible space with various programs. What brought about the idea of a flexible space in a hospital environment? David | The Commonground is a “give-back” to the City of Indianapolis and the citizens of Marion County in thanks for their support in an 85% approval vote to establish a new County Hospital. The space was and is intended to offer opportunities for engagement and program in the context of a high level of design acumen – a draw for anyone in the Indianapolis area, whether seeking Eskenazi’s services or not. To that end, it was designed to foster connections across economic strata, to be a place for social gathering, and healthful living: yoga classes, physical therapy, contemplation, etc. It also provides space for teaching opportunities, as well as social events like movie nights, farmers’ markets, and other gatherings. It was my goal as lead designer to imbue the space with a high level of social purpose, wellness and design. The healing process doesn’t stand solely with the doctors and nurses of the hospital. A significant part of healing is insuring that those entering Eskenazi, whether patients or their family members, feel well in the context of a good public space – that design excellence can serve to reassure and calm people in a time of stress, that an environment of art and design can make one feel better, feel positive, feel strong. The design of The Commonground was informed by five themes: Healing Waters, Nourishing Education, Informative Artwork, Powerful Words, and Cultivating Identity. These principles allowed a framework for discovery and programming throughout the year; contemplative spaces focused on the sounds and micro-climate of water; nutritionally-rich slow-food in a farmers’ market and a local-fare café; a site informed by renowned local and national artists; and regionally identifiable landscape attributes. In all aspects, the environment of The Commonground was designed to foster healing. In a space created for every citizen, the design team concentrated on opportunities for gathering and dialogue – all for the elevation of culture and for the strengthening of spirit. The result is more powerful than could have been envisioned. In the concluding days of construction and in the first few days of the life of the plaza, even with a few rough edges, I have seen people coming to The Commonground, whether seeking Eskenazi services or not, finding all that was intended, and more. I have seen a child afflicted with cancer pulled in a red wagon by his parents to the base of the Falls Fountain to feel the change in climate and hear the lapping water. I have seen a local daycare facility bring their young charges to run and play on the expanse of lawn. On more than one occasion, I have met doctors, nurses and administrators taking their lunch break in the dappled light of the Kentucky Coffee Trees, or a patient connected to an IV drip, removing their socks and stepping into the Healing Waters fountain to feel the cool water on their feet. In recognition of the achievements of this new public hospital, The Wall Street Journal recently cited Eskenazi Health Hospital as one of three nationally-ranked care centers that are healing in the context of art and design. WLA | Did the adjacent Olmsted Brothers landscape influence your design? David | The adjacent Olmsted Brothers’ landscape informed our design, and we informed it, as the historic landscape itself went through significant rejuvenation during the course of the design for The Commonground. We worked with Indiana University-Purdue University Indianapolis (IUPUI) who was refurbishing the site to encourage connectivity from one space to the other. We also knew the renovation of the Olmsted Brothers’ historic Ball Garden and Convalescent Park would be a complement to the contemporary nature of The Commonground. As both landscapes mature, it will be interesting to watch how the two spaces are utilized over the coming years. WLA | You worked with many allied professionals including HOK, DS+R, Ratio, Context, Fluidity, and others. How important was it to work with other professionals? 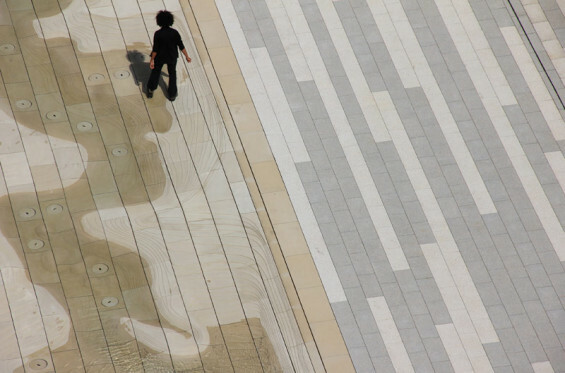 David | At LAND COLLECTIVE, we believe the “collective” consciousness of multiple disciplines positively informs the creation of extraordinary public spaces. What makes landscape so intriguing is the breadth of the discipline. We combine social sciences with ecological sciences and art to render the best possible outcomes. While acting as design lead, it was a rich and rewarding experience to engage other disciplines and ideas in the creation of a new space. 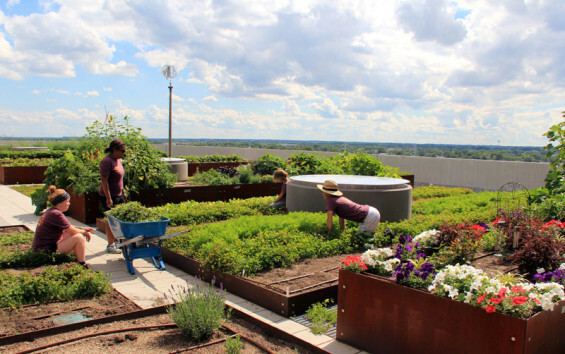 WLA | The Sky Farm (harvestable garden) on the roof of the outpatient care center is an interesting concept. Can you tell us more about how this came about and how it is used by the hospital? David | Although the nickname Sky Farm originated with me, the genesis of the idea and the design itself originated with Erik Reid Fulford of NINebark, Inc. His vision for a nutritionally-rich hospital campus was far more advanced than my own conceptions at the time. And I credit him with educating me to think even more broadly about the definition of a healthful campus. The Sky Farm is his vision of a productive landscape that informs nutritional health and physical wellness. The Sky Farmer and her team generate an abundant yield that serves, among other venues, the hospital commissary. In the coming days and months, patients and hospital employees will have access to plots for their own physical and spiritual benefit. The Sky Farm sits on the roof of the Clinic Building with a panoramic view back to Indianapolis’ downtown. The hospital wings that flank the clinic building upon which the Sky Farm sits extend out like arms embracing the City of Indianapolis. Situated on top of the central Clinic Building, the productive and health-oriented landscape of the Sky Farm addresses the populous of the City that made the hospital possible in the first place. The Sky Farm sits as a fitting tribute to those who helped make it all possible. WLA | What did you learn from undertaking this project? David | This project is very meaningful to our studio, as it transitioned from my body of work at Olin to the establishment of LAND COLLECTIVE and our ethos of empathy-driven design. The principles and approach which informed the design of The Commonground were always solidly based in social gathering and creating an inclusive place for all. It was during my studies in Rome when my work focused on community and productive landscapes that I came to fully realize that my personal empathic nature and my design approach—empathy-driven design—was completely evident in the design of The Commonground. 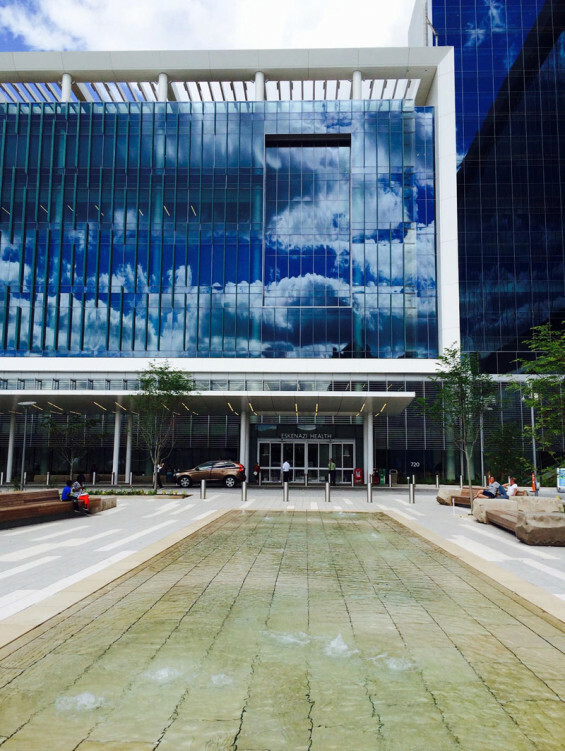 The plaza is a realization which reflects so many things that I care about as a design leader. This project is also dear to our studio, as it shows what is rendered possible when you have total alignment of values between a client and a designer. 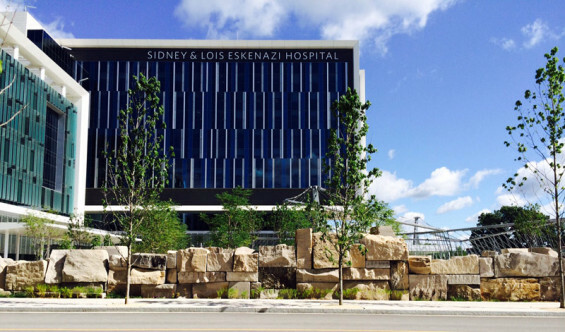 This level of connection made it easy to inform an approach which made the goals of Eskenazi Health visible in the community.